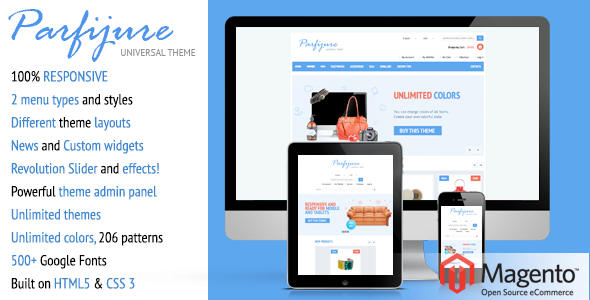 Parfijure – Premium Responsive Magento theme with powerful admin panel and unlimited colors! Parfijure is a universal 100% responsive Magento theme for any kind of shop with modern design, built-in Revolution slider (70$ value!) and powerful backend and it’s created with using the latest HTML5 and CSS3 features. Admin panel with easy navigation and dozens of configuration options allows you to change every thing in theme. You can manage colors of theme elements, select 500+ amazing fonts, apply 200+ pattern backgrounds and setup different theme settings and effects! News slider on HomePage. Add unlimited news from admin panel!